Architectural company FJMT has won the bid to design the Star Entertainment Group’s new six-star hotel planned for Sydney. The proposed Ritz-Carlton hotel and residential tower at The Star is now one step closer to requesting government approval, after FJMT’s design for the tower was unanimously chosen by a five-member design panel over rival schemes by BVN and Grimshaw. The cost of constructing the 230 metre tower, along with all its associated works, will reportedly cost around $500 million. It will consist of 220 hotel rooms and about 150 apartments. According to The Australian, the cost of the tower will be added to an existing $500 million worth of upgrades and ­improvements already planned at The Star. The jury who selected FJMT’s designed said they presented an elegant, international-standard design with a refined, distinctive and visually interesting built form. “The form and profile adjusts progressively to preserve sun ­access into public space, mitigate wind effects, and to share views and amenity with neighbours,” FJMT Design Director Richard Francis-Jones told The Australian. He said his vision for the tower was for a sculpted architecture that would seem to grow from the great sandstone of ­Pyrmont. “This is a landmark project. It will have a huge impact on ­Sydney, the harbour and Pyrmont. 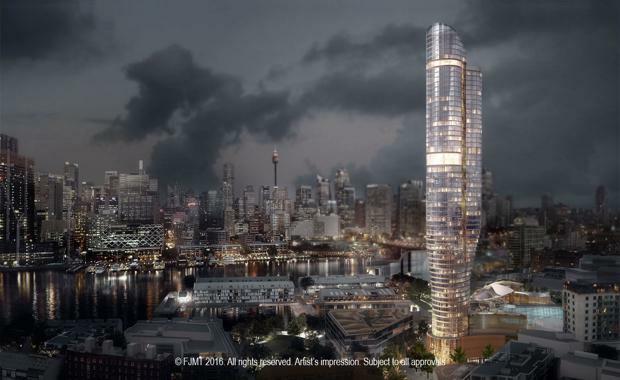 The project is set to rival James Packer’s Crown Resorts tower, which is planned for Barangaroo South on the other side of Darling Harbour. It is likely that The Crown and the Star’s tower will open around the same time, as the Crown’s original opening date in 2019 was pushed back. The tower is expected to be open by mid-2021, and the final design will be submitted to the NSW Department of Planning and Environment for assessment in mid-2017.